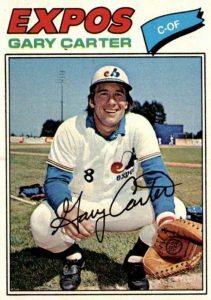 Gary Carter's years with the Montreal Expos put him among the most popular baseball player in Canada and his role as team captain of the New York Mets' 1986 World Series team made him famous around the world. 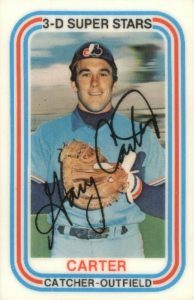 This list collects the best Gary Carter cards including his famous rookie along with a unique minor league appearance. 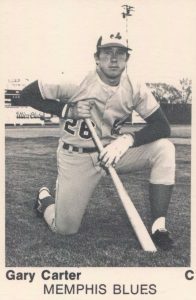 Carter excelled at baseball and football in high school and even turned down a UCLA football scholarship to join the Montreal Expos in the 1972 draft. His exuberance and love of baseball earned him the nickname, "The Kid," and his mixture of good defense and strong bat behind the plate made him a perennial All-Star. A winner of five Silver Slugger awards and three Gold Gloves, the Expos parted ways with Carter before the 1985 season by trading him to the New York Mets. Just a season later he would be key to the Mets run as '86 World Series champs. Carter was elected to the Baseball Hall of Fame in 2003, becoming the first Montreal Expos player to be inducted. Shop for Professionally Graded Gary Carter cards on eBay. While his Expos days are popular, Mets fans can find a notable dual autograph featuring Carter and his teammate Dwight Gooden in 2011 Topps Tribute. Carter passed away after battling cancer in 2012 but his autographed cards continued to be issued into 2013 with Topps Supreme and as a replacement autograph for unfulfilled redemptions. Carter is also regularly featured in modern base sets so fans of the Expos and Mets can find their respective cards to chase. Expos collectors can get their Canadian Carter fix in 2016 Topps Archives, 2015 Topps Archives, and 2013 Topps Triple Threads. Mets fans can find more New York Carter options in 2016 Topps Stadium Club and 2016 Topps Gypsy Queen. 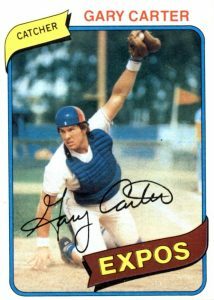 A fan favorite for two franchises, Gary Carter has a ton of baseball cards and many still enjoy a high level of popularity. This list was formed using a combination of card value, card design and availability to the collector. 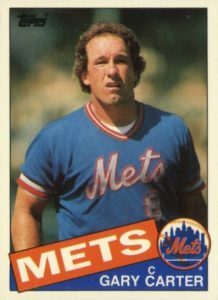 New York Mets fans searching for Carter's first cardboard appearance with the franchise can look to 1985 Topps Traded. This came to be because the Expos unloaded Carter and his growing salary in exchange for four players from the Mets. The trade was a huge success for New York as Carter would become the leader in the clubhouse. He was also named the team captain, an honor given to few players in franchise history. The key version of this card is the high-gloss Tiffany edition. Carter's impressive 1980 Topps card shows the HOF catcher seconds after a play at the plate. The dust in the air around him and the expression on his face gives you an idea of the intensity of the collision that just occurred. The card back notes that Gary's brother Gordon was part of the San Francisco Giants' minor league system for two seasons in the '70s. 1999 Fleer Sports Illustrated contained certified autographs of many legendary players who had been featured on the cover of the famous magazine. Carter had graced the front several times over his career and his card showcased the SI cover from April 4, 1983. While most Carter autographs feature him with the New York Mets, this is a great autograph example for Expos collectors. However, given the age of the set, these are not the most plentiful signed options. 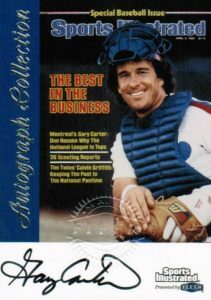 Collectors still have many other choices when it comes to Gary Carter autograph cards. 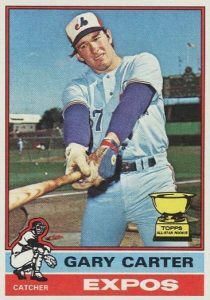 Carter is shown on his 1977 Topps card in a catcher's stance with a broad smile on his face. The 1977 set had 660 cards in total and Topps featured 55 of these players in their experimental cloth sticker set. 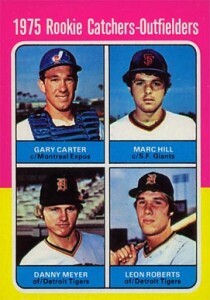 Although Carter was not part of the '77 cloth stickers, 2012 Topps Archives provided collectors with a modern option. The cards in 1976 Hostess came in panels of three that were placed on the bottom of various dessert products. Carter shares his panel with All-Stars Bert Campaneris and Ron Cey. Complete three-card panels, of course, come at a premium as individual cut-out cards often suffer from poor or uneven borders. The cards in the set were given a red, white, and blue color scheme because they were released during the United States Bicentennial in 1976. Carter is also found in subsequent releases from Hostess. My personal favorite card for Gary Carter is his appearance in the 1976 Kellogg's 3D Super Stars set. The blue and red works perfectly with his Montreal Expos jersey. Found in cereal boxes or through a mail-in offer, set builders have discovered that the first three cards are much rarer than the remaining 57. The reverse side of the card compares Carter's love of the game to his future Expos teammate Pete Rose. As an example of this similarity, Carter would always sprint to first after drawing a walk, just like Rose. A must-have collectible for any serious Gary Carter fan is this black-and-white, pre-rookie card from the 1975 TCMA International League set. Not only the first release for Carter, the card actually questions Carter's ability to even make the Expos team. 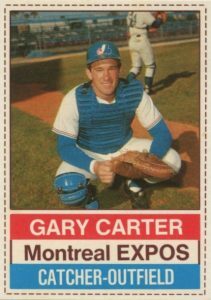 It states that "despite his defensive prowess and great hitting ability, it is unlikely Gary Carter will be the regular catcher for the parent Montreal Expos, at least for a while." Carter would finish second in the voting for NL Rookie of the Year during the same season the card was produced. 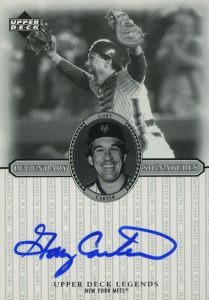 For collectors who became Carter fans because of his role in the 1986 World Series championship run for the Mets, 2000 Upper Deck Legends offers a beautiful on-card autograph. The card shows Carter with his hands in the air after clinching the comeback against the Boston Red Sox. Helping the visual appeal, the black-and-white scheme makes the blue ink signature really stand out. Carter's autograph is typically very readable with a flamboyant "G" to start it off. Carter split time as a right fielder and catcher in his first full season with the Expos and he was actually selected to his first All-Star game as an outfielder. His 1976 Topps card logically features the Topps All-Star Rookie Cup logo as Carter was the runner-up in NL Rookie of the Year voting behind San Francisco Giants pitcher John Montefusco. Carter did win the Sporting News vote for 1975 Rookie of the Year after hitting 17 home runs and 68 RBI. Carter is without a doubt the highlight of this multi-player rookie card from 1975 Topps. The set is famous for its rookie cards as Hall of Fame members Robin Yount, George Brett, Jim Rice, and Carter all debuted in the product. Carter completists will need to track down the mini version of his rookie as well as the O-Pee-Chee edition, which was made for the Canadian market. As Carter may well have been the most popular player in Canada during his time with the Expos, expect to pay a premium for the OPC card. Mint examples of his regular Topps appearance can approach $500 at auction with gem-mint attracting prices as much as ten times that amount. Good choices, Matt. I might have picked another oddball or two — maybe one of those Zeller’s cards that came in three-card panels and had baseball tips, or perhaps a postcard. But, all in all, tough to quibble too much with these. Love Mr Carter. Thanks for this. GARY CARTER 1999 FLEER SPORTS ILLUSTRATED AUTOGRAPH AUTO -EXPOS! !